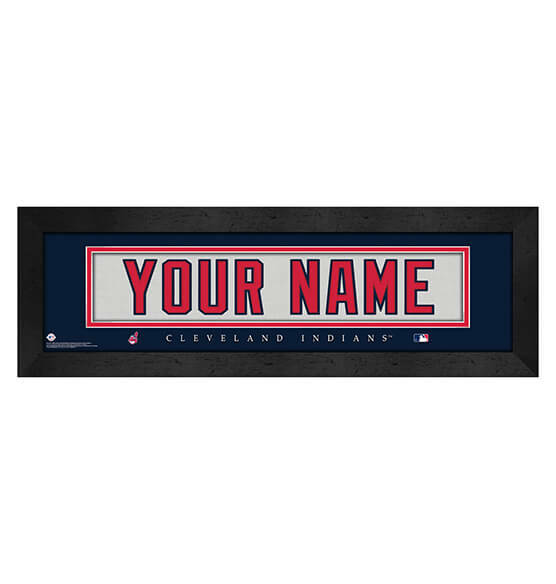 Add some flair to your home, office or fan zone with this Cleveland Indians Personalized Nameplate. This customized wall decor is made to order with any name or nickname you specify up to 12 characters. Made to look like the back of a Cleveland Indians jersey, it features vibrant team colors and an attractive double-mat setting that you'll be proud to hang. High-quality clear glass protects this epic print that is nestled inside a premium black frame. Purchased for yourself or a loved one who is a Cleveland Indians fan, this custom wall art is sure to be a four-bagger!